There is no denying the fact that E-commerce is thriving without a stop and has surely become a profitable shot for businesses today. However, as an owner of an E-commerce business, there are specific factors one must be wary about to make sure that the brand is sustaining seamlessly. And, one of the most important aspects is sales conversions. Just so you should know, a potential lead goes through several stages to get converted into a customer. E-commerce Funnel is the thing that represents all of these stages in detail. Not just a customer’s journey, but this funnel also showcases where exactly your visitors and abandoning your website without making a purchase. Thus, as a business owner, it becomes quite important for you to find out why your visitors are ditching you. With such data in hand, you’d be able to optimize your website accordingly and boost skyrocket revenue. If you’re looking forward to having an easier way, you can make use of one of the most popular campaign management tool, which is known as HumCommerce. Here is a quick review of this amazing tool to help you understand what it is capable of. Being an online campaign management tool, HumCommerce is specifically for E-commerce websites. 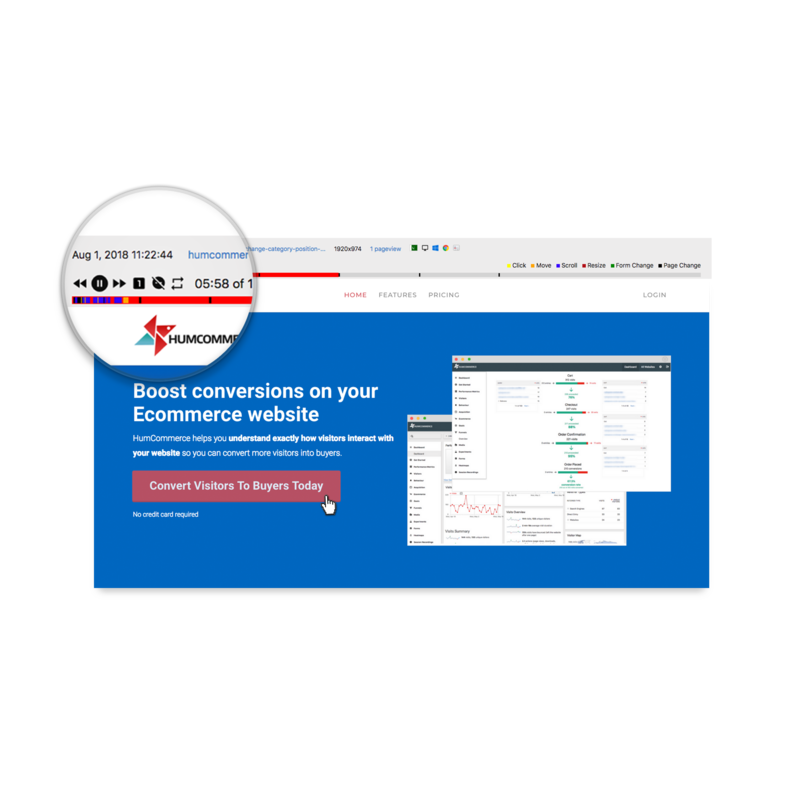 This tool is created to assist you in enhancing the conversion rate on your website by having a profound understanding of how your visitors are interacting with your products as well as the website as a whole. What Is Special About HumCommerce? Apart from offering a myriad of effective features, HumCommerce even offers a central dashboard that organizes all the essential reports and data and put forth for you whenever you require it. On this dashboard, you can have every important tool just within reach of a click. Heatmaps are one of the most considerable features of this tool. With this one feature, you can easily figure out such parts of your website that are procuring maximum engagement and clicks. And, in this way, you can even figure out such parts that need more attention and optimization to attract visitors. If you’re looking forward to having a tool that lets you analyze mouse movements, scroll data, and clicks for individual pages, this is the feature to rely upon. With this feature, you can, very easily, record every single movement of your visitors and enhance your conversion funnel with the data obtained. This feature helps you gather valuable and important information of what your visitors do before dropping off the conversion funnel or making a purchase. A/B testing allows you to figure out what is working on your Ecommerce store and what needs improvements. This tool helps you find out a perfect web page design, based on the preferences of live visitors. HumCommerce even provides you the ease of finding and analyzing adequate keywords from the dashboard that can help you rank higher on search engines, like Bing and Google. If you have a variety of forms on your E-commerce website, you can use this tool to analyze how they are performing. With this, you can understand the most and least performing fields on the forms; thus, you’ll have an idea of what to keep and what to remove. 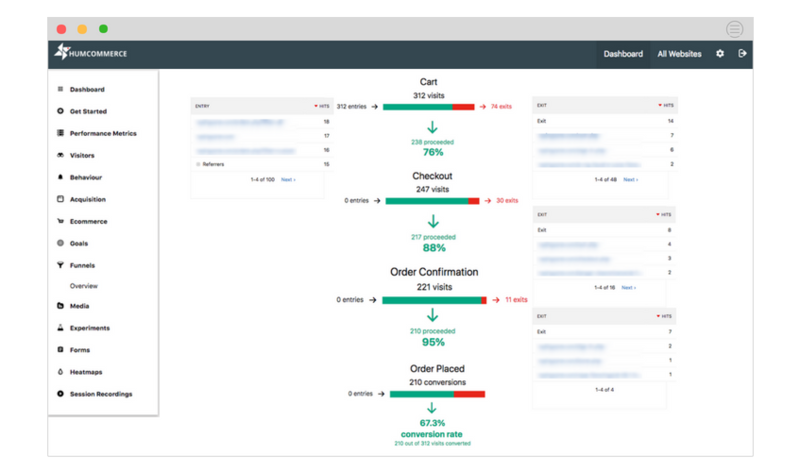 When it comes to tracking the user flow so as to optimize the purchase flow, HumCommerce allows you to set up conversion funnels. Thus, gaining maximum conversions becomes an efficient and effective task for your website. To analyze the performance of campaigns and to measure their success, this tool offers six different kinds of attribution models available on the dashboard. In comparison with other tools, HumCommerce is an easy and intuitive campaign management tool available out there. It is handy as well as easy to set. Without posing enough problems, HumCommerce integrates and synchronizes with almost every part of your Ecommerce website. Its smooth functionality makes sure that you don’t miss any essential information. Furthermore, to save your time and efforts, HumCommerce even offers its own dedicated dashboard that has every option you may want for your online store. One of the primary features of this tool is the Heatmap option. 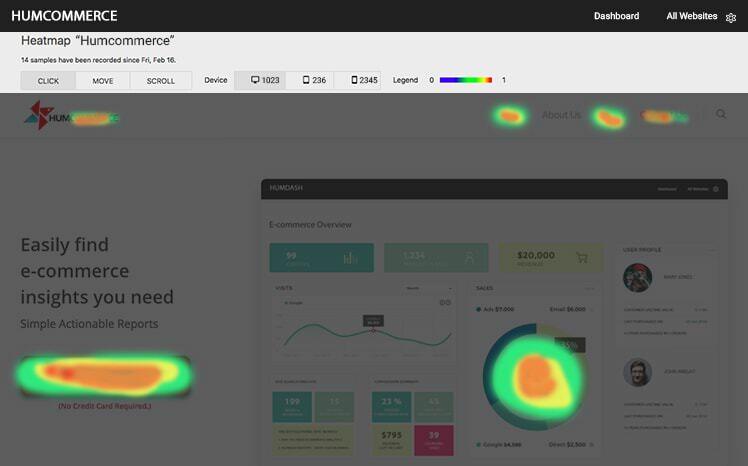 Basically, heat maps let you analyze the actions of visitors on forms or different web pages. Not just that, but you can even track sessions recordings and the users’ flow with heat maps. And then, this feature gathers the data and presents it in the virtual heat map form, showcasing different areas of the website that obtained high, moderate, and low engagements. This makes you figure out what is not working for your website visitors. Thus, tweaking those points will be easier to gain a higher conversion rate. If you intend to rank your products or website higher, it is highly recommended to track keywords for pages and forms that can help you grab a significant place on search engines. This tool provides an inbuilt keyword tracker that you can easily connect with webmaster tools. In this way, you can get timely updates on keywords that are ranking for your niche or products. Of course, it can save you a lot of time, and you wouldn’t have to navigate through several websites to find out relevant keywords, right? You can even analyze these keywords based on the traffic of the website. With access to every important information at one place, you’d be able to make better decisions and track results simultaneously as well. A/B testing is one such feature of HumCommerce that lets you figure out what kind of design combination is working for your website. How are the buttons? Is the color appropriate? What about the images on your website? There’s literally a lot that can be judged by this feature. Along with making you run the business easily, HumCommerce also allows you to keep a track on latest results and trends. Instead of hopping from one place to another just to get valuable data, this tool offers beneficial insights just within one single report. For every kind of eCommerce business, this tool helps in to generate quick reports for data that is related to internet marketing and online campaigns. This tool offers prompt access to website’s visitor logs that comprises valuable information, such as the source of traffic, the platform of website access, a primary action they took on the website, duration of stay, and much more than that. If you have just started with your Ecommerce store, this free plan would be the best choice for you. However, if your store is already dealing with a huge influx of traffic, you may have to spend a few bucks to buy the premium plan. Out of these three plans, you can choose the one according to your business requirements and your budget. Thus, that’s how you can obtain a greatly significant tool by just paying a small amount. Undoubtedly, HumCommerce offers you access to several insights. Moreover, it eradicates the requirement to use multiple tools at once. For instance, if you’d want to have analytics tools and a heat maps tool, so instead of getting two different of them, you can simply get your hands on HumCommerce. With that being said, the interface of this tool is even smooth and marvellous. And, all of the available features are, of course, significant benefits that you can get from this tool. So, go ahead and try it once. Optimize your Ecommerce website and increase your conversion rates with HumCommerce without spending a lot from your pocket.